The Value Added Tax (VAT) is a form of consumption tax that taxes all business profit and labor. The tax is levied on the value added to the product at each stage of its manufacturing cycle as well as the price paid by the final consumer. Commonly, the seller at each stage subtracts the sum of taxes paid on items purchased from the sum of taxes collected on items sold; the net tax liability is the difference between tax collected and tax paid. The cost of materials, subcomponents, tools, equipment, facilities, supplies, and so forth, and any services purchased from other businesses, are not retaxed under the VAT. Those purchases would have already been subjected to the VAT by the supplying businesses. The VAT was first adopted in France in 1954. By the end of the twentieth century it had been adopted throughout the European Union and in many countries in Africa, Asia, and South America. Notably, the United States and Canada did not follow suit. The burden of VAT, like other consumption taxes, tends to be passed on to the consumer. Additionally, since this is a regressive tax, lower income people have the greatest burden. To offset this, necessities are often taxed at a lower rate than luxury items. Advocates of the VAT contend that it is an efficient method of raising revenue, and would permit concomitant reductions in income tax. Opponents argue that, as a regressive tax, it puts too much burden on those who are least able to afford it. It is only when human nature changes from selfishness to caring for others and society as a whole that the problems inherent in taxation can be resolved, both by those designing the system and by those paying and collecting the taxes. Value added tax (usually shortened to VAT) is a levy on the amount a business add to the price (hence the name "value added") of goods during their production and distribution. Since it is a tax on commodities purchased, ultimately for consumption, rather than on the income of an individual or corporation, it is essentially a consumption tax. The VAT is usually collected by the tax credit method; each firm applies the tax rate to its taxable sales, but is allowed a credit for value-added tax paid on its purchases of goods and services for business use, including the tax paid on purchases of capital equipment under a consumption-type value-added tax. As a result, the only tax for which no credit would be allowed would be that collected on sales made to households, rather than to businesses. Since the sum of the values added at all stages in the production and distribution of a good are equal to the retail selling price of the good, the revenue base of a retail sales tax and a value-added tax with the same coverage are theoretically identical, and a given tax rate will yield the same amount of tax revenue under either approach and under equal conditions of implementation, in other words, no exceptions or exemptions. The VAT was invented by a French economist in 1954. Maurice Lauré, joint director of the French tax authority, the Direction générale des impôts, as taxe sur la valeur ajoutée (TVA in French) was first to introduce VAT with effect from April 10, 1954, for large businesses, and extended over time to all business sectors. In France, it is the most important source of state finance, accounting for approximately 45 percent of state revenues. West Germany adopted VAT in 1968, and subsequently most other Western European countries also implemented some form of VAT. Many countries in Africa, Asia, and South America have also followed suit. Although the United States as a whole has not, the state of Michigan has used a value added tax. Today, all members of the European Union are required to implement VAT. VAT that is charged by a business and paid by its customers is known as output VAT (that is, VAT on its output supplies). VAT that is paid by a business to other businesses on the supplies that it receives is known as input VAT (that is, VAT on its input supplies). A business is generally able to recover input VAT to the extent that the input VAT is attributable to (that is, used to make) its taxable outputs. Input VAT is recovered by setting it against the output VAT for which the business is required to account to the government, or, if there is an excess, by claiming a repayment from the government. Under the European Union system of VAT, where a person carrying on an economic activity supplies goods and services to another person, and the value of the supplies passes financial limits, the supplier is required to register with the local taxation authorities and charge its customers, and account to the local taxation authority for VAT (although the price may be inclusive of VAT, so VAT is included as part of the agreed price, or exclusive of VAT, so VAT is payable in addition to the agreed price). Different rates of VAT apply in different EU member states. The minimum standard rate of VAT throughout the EU is 15 percent, although reduced rates of VAT, as low as five percent, are applied in various states on various sorts of supply (for example, domestic fuel and power in the UK). The maximum rate in the EU is 25 percent. The Sixth VAT Directive requires certain goods and services to be exempt from VAT (for example, postal services, medical care, lending, insurance, betting), and certain other goods and services to be exempt from VAT but subject to the ability of an EU member state to opt to charge VAT on those supplies (such as land and certain financial services). Input VAT that is attributable to exempt supplies is not recoverable, although a business can increase its prices so the customer effectively bears the cost of the 'sticking' VAT (the effective rate will be lower than the headline rate and depend on the balance between previously taxed input and labor at the exempt stage). Finally, some goods and services are "zero-rated." The zero-rate is a positive rate of tax calculated at zero percent. Supplies subject to the zero-rate are still "taxable supplies," in other words, they have VAT charged on them. In the UK, examples include most food, books, drugs, and certain kinds of transport. The zero-rate is not featured in the EU Sixth Directive as it was intended that the minimum VAT rate throughout Europe would be five percent. However, zero-rating remains in some member states, most notably the UK, as a legacy of pre-EU legislation. These member states have been granted a derogation (partial revocation of the law) to continue existing zero-rating but cannot add new goods or services. The UK also exempts or lowers the rate on some products depending on situation; for example milk products are exempt from VAT, but a milk drink served in a restaurant is subject to VAT. Some products such as feminine hygiene products and baby products are charged at five percent VAT along with domestic fuel. When goods are imported into the EU from other states, VAT is generally charged at the border, at the same time as customs duty. "Acquisition" VAT is payable when goods are acquired in one EU member state from another EU member state (this is done not at the border but through an accounting mechanism). EU businesses are often required to charge themselves VAT under the reverse charge mechanism where services are received from another member state or from outside of the EU. Businesses can be required to register for VAT in EU member states, other than the one in which they are based, if they supply goods via mail order to those states, over a certain threshold. Businesses that are established in one member state but which receive supplies in another member state may be able to reclaim VAT charged in the second state under the provisions of the Eighth VAT Directive (Directive 79/1072/EC). To do so, businesses have a value added tax identification number. A similar directive, the Thirteenth VAT Directive (Directive 86/560/EC), also allows businesses established outside the EU to recover VAT under certain circumstances. Despite its multistage character, explained in the above section a value-added tax is very much like a retail sales tax in that it is a tax on expenditures by consumers or, in other words, it is just another type of consumption tax. Since the sum of the values added at all stages in the production and distribution of a good are equal to the retail selling price of the good, the revenue base of a retail sales tax and a value-added tax with the same coverage are theoretically identical, and a given tax rate will yield the same amount of tax revenue under either approach. There are, however, significant differences in the impacts of different types of consumption tax. Retail sales tax, the familiar percentage tax on retail sales, is one type of consumption tax. In this tax, a simple percentage is added to the retail price of goods when sold to the consumer, but not when sold for resale to a retailer, or to a manufacturer as parts in production of a new commodity. Sales tax does not distort the production structure as would the VAT, and it would not skew individual preferences as would specific excise taxes (Rothbard 1994). The VAT consumption tax, standard in Europe and other parts of the world, imposes a hierarchical tax on the "value added" by each firm and business. This would tend to distort the structure of business. For one thing, there would be an incentive for uneconomic vertical integration, since the fewer the number of times a sale takes place, the fewer the imposed taxes. Also, as has happened in European countries with experience of the VAT, a flourishing industry may arise in issuing phony vouchers, so that businesses can over-inflate their alleged expenditures, and reduce their reported value added. A sales tax, other things being equal, seems to be both simpler, less distorting of resources, and enormously less bureaucratic than the VAT. Indeed the VAT seems to have no clear advantage over the sales tax, except of course, if multiplying bureaucracy and bureaucratic power is considered a benefit (Rothbard 1994). Another way of looking at this issue is this. VAT differs from a conventional sales tax in that VAT is levied on every business as a fraction of the price of each taxable sale they make, but they are in turn reimbursed VAT on their purchases, so the VAT is applied to the value added to the goods at each stage of production (Sharma 2005: 916; quoted in Muller 2007:64). Sales taxes are normally only charged on final sales to consumers: because of reimbursement, VAT has the same overall economic effect on final prices. The main difference is the extra accounting required by those in the middle of the supply chain; this disadvantage of VAT is balanced by application of the same tax to each member of the production chain regardless of its position in it and the position of its customers, reducing the effort required to check and certify their status. When the VAT has few, if any exemptions such as with GST in New Zealand, payment of VAT is even simpler. Generally speaking, if sales taxes exceed ten percent, people start engaging in widespread tax evasion activities (like buying over the Internet, pretending to be a business, buying at wholesale, buying products through an employer, and so forth). On the other hand, total VAT rates can rise above ten percent without widespread evasion because of the novel collection mechanism, which not only keeps the tax liability of the final consumer at a lower level but also makes such evasions impossible since all purchases are taxed, including wholesale and so on. However because of its particular mechanism of collection, VAT becomes quite easily the target of specific frauds. The standard way to implement a VAT is to say a business owes some percentage on the price of the product minus all taxes previously paid on the good. If VAT rates were ten percent, an orange juice maker would pay ten percent of the $5 per gallon price ($0.50) minus taxes previously paid by the orange farmer (say $0.20). In this example, the orange juice maker would have a $0.30 tax liability. Each business has a strong incentive for its suppliers to pay their taxes, allowing VAT rates to be higher with less tax evasion than a retail sales tax. Consider the manufacture and sale of any item, which in this case we will call a widget. A widget manufacturer spends $1 on raw materials and uses them to make a widget. The widget is sold wholesale to a widget retailer for $1.20, making a profit of $0.20. The manufacturer pays $1.00 for the raw materials, certifying it is not a final consumer. The manufacturer charges the retailer $1.20, checking that the retailer is not a consumer, leaving the same profit of $0.20. The retailer charges the consumer $1.65 ($1.50 + ten percent) and pays the government $0.15, leaving the same profit of $0.30. So the consumer has paid ten percent ($0.15) extra, compared to the no taxation scheme, and the government has collected this amount in taxation. The retailers have not lost anything directly to the tax, but they do have the extra paperwork to do so that they correctly pass on to the government the sales tax they collect. Suppliers and manufacturers have the administrative burden of supplying correct certifications, and checking that their customers (retailers) are not consumers. The manufacturer pays $1.10 ($1 + ten percent) for the raw materials, and the seller of the raw materials pays the government $0.10. 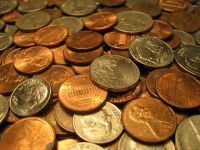 The manufacturer charges the retailer $1.32 ($1.20 + $1.20 x ten percent) and pays the government $0.02 ($0.12 minus $0.10), leaving the same profit of $0.20. The retailer charges the consumer $1.65 ($1.50 + $1.50 x ten percent) and pays the government $0.03 ($0.15 minus $0.12), leaving the same profit of $0.30. So the consumer has paid ten percent ($0.15) extra, compared to the no taxation scheme, and the government has collected this amount in taxation. The businesses have not lost anything directly to the tax, but they do have the extra paperwork to do so that they correctly pass on to the government the difference between what they collect in VAT (output VAT, an 11th of their income) and what they spend in VAT (input VAT, an 11th of their expenditure). Note that in each case the VAT paid is equal to ten percent of the profit, or "value added." The advantage of the VAT system over the sales tax system is that businesses cannot hide consumption (such as wasted materials) by certifying it is not a consumer. In the above example, it was assumed that the same number of widgets were made and sold both before and after the introduction of the tax. This is not true in real life. The fundamentals of supply and demand suggest that any tax raises the cost of transaction for someone, whether it is the seller or purchaser. 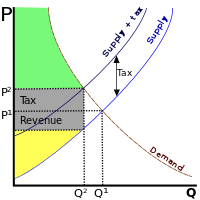 In raising the cost, either the demand curve shifts leftward, or the supply curve shifts upward. The two are functionally equivalent. Consequently, the quantity of a good purchased, and/or the price for which it is sold, decrease. This shift in supply and demand is not incorporated into the above example, for simplicity and because these effects are different for every type of good. The widget example assumes the tax is non-distortionary. A VAT, like most taxes, distorts what would have happened without it. Because the price rises for someone, the quantity of goods traded decreases. Correspondingly, some people are worse off by more than the government is made better off by the tax income. That is, more is lost due to supply and demand shifts than is gained in tax revenue. This is known as a deadweight loss. The income lost by the economy is greater than the government's income; the tax is inefficient. The entire amount of the government's income (the tax revenue) may not be a deadweight drag, if the tax revenue is used for productive spending or has positive externalities—in other words, governments may do more than simply consume the tax income. While distortions occur with consumption taxes like VAT, they are often considered superior because they distort incentives to invest, save, and work less than most other types of taxation—in other words, a VAT discourages consumption rather than production. However, taxes on consumption still have negative impact, unlike land value tax which neither causes deadweight losses nor distorts incentives. A tax is regressive if the average tax rate falls with an increase in income, proportional if the average tax rate is constant, and progressive if the average tax rate rises with income. Simply put, low-income people pay a higher fraction of their income in taxes than wealthier people if the tax is regressive and a lower fraction if the tax is progressive. VAT, as all types of consumption tax, is often criticized as unfair to lower income individuals and families. The regressivity of VAT, or the relatively higher burden of the tax at the lower income levels than at the higher income levels, may be offset by adjustments to income tax rates, or credits against the income tax. These measures, however, add to the administrative burden of VAT and tend to lead to increases in income taxes, at least for those in higher income brackets. The regressive effect may also be reduced by taxing necessities at lower rates than luxury items. Again, though, this increases the burden of collection by having multiple rates, as well as leading to lobbying of various sectors competing for lower tax rates for their goods and services. Countries with VATs have a much heavier total tax burden than those without VATs. Before the creation of VATs, the burden of taxation in Europe was not that much larger than it was in the United States. However, since the late 1960s, when countries in Europe began to adopt VATs, Europe’s aggregate tax burden has increased by about 50 percent while the U.S. tax burden has remained relatively constant (Bickley 2003). One of the main arguments for the VAT is that it is a less destructive way to raise revenue. This is theoretically true, but irrelevant. In the real world, the VAT has been used as an excuse to increase income taxes as a way to maintain “distributional neutrality.” Indeed, income taxes in Europe today are higher than they were when VATs were implemented. Assuming an accommodating monetary policy, a sales tax would almost certainly increase the price level by roughly the percentage it represents of consumption spending. That is, a four percent sales tax that applied to 75 percent of consumption expenditures would increase the general price level by about three percent. Although this would be a one-time occurrence, not an annual increase, it might cause "ripples" of wage increases, because of cost-of-living adjustments and these could be reflected in further price increases. To the extent the sales tax replaced part of the income tax, there would be little offsetting reduction in prices or wages. A VAT undermines economic growth in two ways. First, it reduces incentives to engage in productive behavior by driving a larger wedge between pre-tax income and post-tax consumption. Second, it facilitates larger government and the concomitant transfer of resources from the productive sector of the economy to the public sector, reducing jobs in production and diminishing economic efficiency (Engen and Skinner 1992). The VAT was invented in Europe mainly to facilitate trade, particularly among members of the European Union. They needed a tax that could be applied at the border on imports and rebated at the border on exports, thus preventing taxes from multiplying every time goods passed through a country. The VAT does this by applying incremental taxes at each stage of production or distribution, with an invoice trail detailing how much tax was embedded in the price (Bartlett 2005). This is the best strategy tax economists have ever devised for raising revenue without investing a lot in enforcement and economic incentives. The V.A.T. is a kind of sales tax embedded in the price of goods. ... [T]he tax is largely self-enforcing. And because the tax is applied only to consumption, its impact on incentives is minimal (Bartlett 2006). In half a century, value added tax has taken the world by storm... But despite its reach, some are ready to declare it an idea whose time has gone…. VAT fraud has become pervasive and, at least in Europe, the tax is at a watershed. Can it survive in its current form? ...[I]t is in Europe that the weaknesses are at their most glaring. This month the European Commission launched an “in-depth debate” on whether VAT should be modified. ... European VAT is in a mess for two main reasons: its vulnerability to fraud and its complexity. Fraud, evasion and avoidance cost at least one in every 10 euros of the tax collected – roughly double that in other industrialised countries... VAT abuse takes many forms – most commonly the reluctance of traders in the black economy to have anything to do with the tax. But the biggest headache is sophisticated fraud (Financial Times 2006). As well as the administrative issues faced by exporters, businesses are often left paying heavy VAT bills as a result of governments’ exemption of certain types of goods and services, such as education, from the tax. As a result, some critics have argued that governments should reduce, if not eliminate, exemptions and reductions. Proponents of the value-added tax have suggested that VAT might be able to improve economic performance by facilitating a reduction in other taxes, such as personal and corporate income taxes. A broad-based sales tax would almost certainly distort economic choices less than the income tax does. Additionally, an important advantage of the value-added form of sales tax is the fact that tax is collected as products move from stage to stage in the production-distribution process. Thus by the time a product reaches the retail stage, much of its total value has already been taxed. There are obviously two contradicting views on the very basics of VAT. If the VAT was actually used to eliminate all income taxes, this approach would have considerable merit. There is no doubt that personal and corporate income taxes do more damage per dollar raised than a VAT would (Guseh 1977). However, no nation has ever implemented a VAT (or a national sales tax) and used the money to eliminate all income taxes. Indeed, no government in the world—national, state, provincial, county, or city—has taken this step. No government has even eliminated just one of the two forms of income taxation (personal and corporate). The VAT always has been imposed in addition to existing personal and corporate income taxes (Grier and Tullock 1989). Faced with this overwhelming real-world evidence, VAT advocates sometimes argue that the tax at least could be used to lower taxes on personal and corporate income. Just like the total replacement hypothesis, this partial-replacement hypothesis is an interesting theory, but it is equally implausible. All available statistics show that the aggregate tax burden on income and profits (a measure of the tax on personal and corporate income) has fallen slightly in the United States, but it has risen significantly in the European Union, and this increased tax burden on productive activity took place after VATs became ubiquitous (Genetski et al 1988). The government exacts from a taxpayer the payment of a given tax in the shape of money. To meet this demand, the taxpayer exchanges part of the products at his disposal for coin, which he pays to the tax-gatherers (Say 1880). in the end . . . this value is consumed; and then the portion of wealth, which passes from the hands of the taxpayer into those of the tax-gatherer, is destroyed and annihilated (Say 1880). Were it not for taxes, the taxpayer would have spent his money on his own consumption. As it is, the state. . enjoys the satisfaction resulting from that consumption (Say 1880). It is virtually a burthen imposed upon individuals, either in a separate or corporate character, by the ruling power... for the purpose of supplying the consumption it may think proper to make at their expense (Say 1880, 446). But taxation, for Say, is not merely a zero-sum game. By levying a burden on the producers, he points out, "taxes, over time, cripple production itself." Taxation deprives the producer of a product, which he would otherwise have the option of deriving a personal gratification from, if consumed... or of turning to profit, if he preferred to devote it to an useful employment... Therefore, the subtraction of a product must needs diminish, instead of augmenting, productive power (Say 1880, 447). The best scheme of [public] finance is, to spend as little as possible; and the best tax is always the lightest (Say 1880). To this, there is nothing more to add. Bartlett, Bruce. 2005. The Right VATitude National Review Online. Retrieved June 24, 2008. ———. 2006. The Best Kind of Tax The New York Times. Retrieved June 24, 2008. Bickley, James. 2003. A Value-Added Tax Contrasted with a National Sales Tax. Congressional Research Service. Retrieved June 24, 2008. Engen, Eric M. and Jonathan Skinner. 1992. Fiscal Policy and Economic Growth. National Bureau of Economic Research Working Paper No. 4223. Financial Times. 2006. Evasion and exemptions erode VAT's own value added. Financial Times. Genetski, Robert J., Debra J. Bredael, and Brian S. Wesbury. 1988. The Impact of a Value-Added Tax on the U.S. Economy. Stotler Economics. Grier, Kevin B. and Gordon Tullock. 1989. An Empirical Analysis of Cross-National Economic Growth, 1951–80. Journal of Monetary Economics 24(2):259–276. Guseh, James S. 1997. Government Size and Economic Growth in Developing Countries: A Political-Economy Framework. Journal of Macroeconomics 19(1):175–192. ———. 1981. The Myth of Neutral Taxation. Cato Journal. 1:551–54. ———. 1988. Review of A. Chafuen, Christians for Freedom: Late Scholastic Economics. International Philosophical Quarterly. 28:112–14. ———. 1994. Consumption Tax: A Critique. Review of Austrian Economics. 7(2):75–90. History of "Value added tax"
This page was last modified on 14 January 2016, at 16:41.